As Idaho's largest and oldest performing arts organization, (established as the Boise Philharmonic in 1960) the symphony performs for over 50,000 people annually in concerts at the Morrison Center, NNU's Brandt Center in Nampa, in schools around the state, and in smaller recital halls and venues. The 80+ member professional orchestra can trace its roots to earlier than 1885 with the formation of the Boise City Orchestra. 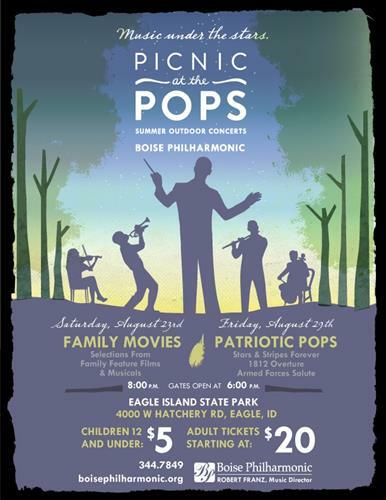 The Boise Philharmonic performs fourteen Masterworks concerts per season, with repertoire from the most well known classical and contemporary composers, as well as commissioning new works. Additionally, a variety of ''Pops'' concerts, a chamber music series, and other symphonic events round out each concert season. The musicians in the Boise Philharmonic hail from the best music schools in the country, including the Juilliard School in New York, the Eastman School of Music, Northwestern University, San Francisco Conservatory, and many others. The Boise Philharmonic maintains a vast array of educational programs including: Musically Speaking, Backstage with the Artists, classes for young children, the Boise Philharmonic Youth Orchestra, the annual Children's Concerts with full symphony orchestra performing for 12,000 school children in 9 free performances, Verde Percussion Group - a purely percussion performance, Musicians in the Classroom, Ensembles in the Schools, and Conductor in the Schools.